We have state of the art fabrication equipment and a material tracking system operated by a dedicated team of experienced operators to deliver material on time and as ordered. 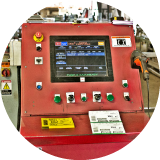 Our tracking system uses barcode scanning technology to record every step of the fabrication process, including the date and time of each operation and the persons responsible for all stages of producing and shipping an item. 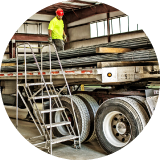 Additionally, we are able to manage and track the heat information for every piece of rebar, allowing us to provide our customers with timely and accurate mill test reports as required. We stock Grade 60 and Grade 75 rebar in A615, A775 and A706 in sizes ranging from #3 up to #18. Stainless, Fiberglass and Hot-Dipped Galvanized rebar is available as well. We also fabricate spirals utilizing #3 to #7 bar. Spirals can be made as small as 6.5” to as large as 7’ in diameter. 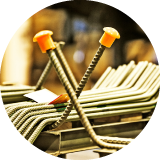 We stock a full range of products from welded wire mesh, mechanical couplers and supports to tie wire, anchor bolts and smooth dowels.